A recently completed survey of Exhaust Gas Cleaning Systems Association (EGCSA) members reports a rapidly accelerating uptake of marine scrubbers with 71 scrubbers ordered in May 2018 alone. At the end of May 2018, the number of ships with exhaust gas cleaning systems installed or on order stood at 983.This follows a slew of recent scrubber orders by major ship operators, including Spliethoff, Frontline, DHT and Star Bulk, who have opted for exhaust gas cleaning systems.The survey shows that 63% of all ships have either been or will be retrofitted with scrubbers, while 37% are new build installations. With uptake of scrubbers across the global shipping fleet on the rise, shipowners are expected to spend more than US$20BN over the next five years on exhaust gas cleaning systems.Back in 2015, in readiness for the switch to 0.10% sulphur fuel, a number of RORO and ferry operators led the way and opted for scrubbers as a means of compliance. The cruise industry came next and now, with 2020 looming, bulk carriers have taken over as the leading shipping sector to adopt exhaust gas cleaning, with container ships and tankers following. In each of these sectors retrofit open loop installations predominate. Nearly 60% of all retrofits and new building installation works take place in Asian yards. Unsurprisingly this increases to nearly 85% for new build installations. EGCSA director Don Gregory believes that, “although there has been a surge in demand, yard capacity is not an issue going forward. However other constraints such as the availability of laser scanning specialists and experienced installation teams mean that it may not be possible to pick and choose an installation slot nor coincide a scrubber installation with an already scheduled drydock in the near future.” For this reason, several scrubber manufacturers are now taking options through to 2023 to enable ship-owners to secure a position on the installation timetable. Until relatively recently, the largest installed exhaust handling capacity was for engine powers in the region of 25 to 30MW. However, the latest data shows that this has been well and truly exceeded by a retrofitted hybrid system for a 72MW container ship engine. Large capacity scrubbers are not confined to retrofits as the maximum size new building installation is a hybrid system for a 65MW engine. 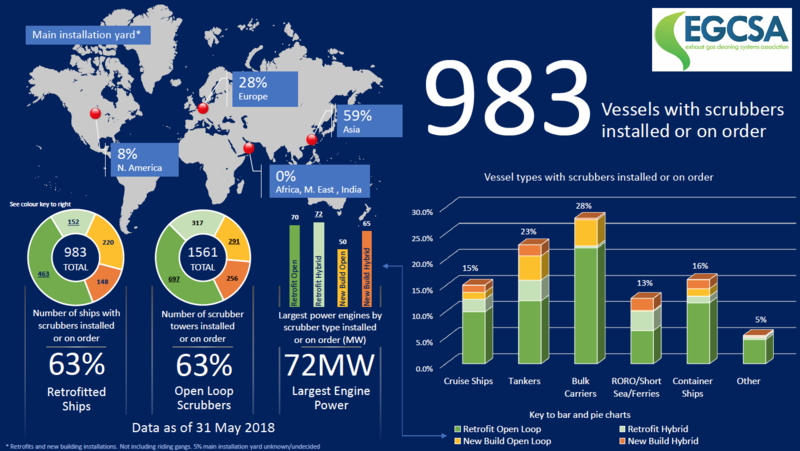 Of the 983 vessels with scrubbers installed or on order, 63% have opted for open loop scrubbers; confirming it as the most popular exhaust gas cleaning system. The EGCSA is not surprised that open loop scrubbing is preferred. “It is the simplest scrubbing system and favoured by ship crews,” Don Gregory explains. Although many early adopters in the North Sea and Baltic fitted hybrid systems, they are operated in open loop the majority of the time. Open loop scrubbing has also been used for years by coastal power stations and by oil tanker inert gas (IG) systems when in port without environmental issues. While closed loop and hybrid systems are available for enclosed bodies of water with little water exchange or where discharges are restricted by local regulation, the ECGSA suggests open loop operators switch to low sulphur fuel for port stays where open loop operation is not possible. The cost impact is likely to be limited as over 90% of fuel consumption is during full away at sea, which is where the financial benefits of scrubber-related fuel savings really accrue. Download the EGCSA infographic with an overview of data illustrated by scrubber type– retrofit open loop, retrofit hybrid, new build open loop and new build hybrid.